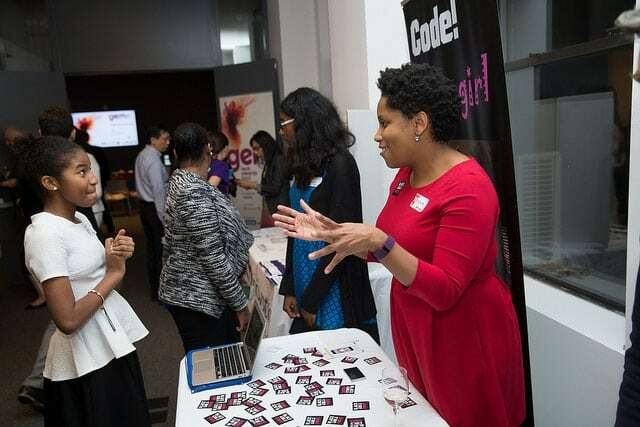 Black Girls Code was founded in 2011 by Kimberly Bryant with a mission of increasing the number of women of color in the digital space by empowering girls of color ages seven to 17 to become innovators in STEM fields, leaders in their communities, and builders of their own futures through exposure to computer science and technology. Their goal is to train Black youth with the skills to occupy some of the 1.4 million computing job openings expected available in the U.S. by 2020, and to train one million girls by 2040. Forbes reports that according to the nonprofit Computing Technology Industry Association (CompTIA), a quarter of the over five million tech jobs last year were held by women in 2016, but the percentage of women of color in the industry —particularly black and Hispanic workers—in the industry stands at single digits. Sixty percent of girls who had considered an IT career had a family member or friend working in the field, but women of color are the group least likely to have highly visible role, according to CompTIA president and CEO Todd Thibodeaux. Google hopes that by sharing space with Black Girls Code, they will be able to introduce more students to more tech companies and attract more volunteers and mentors. Additionally, this Google donation, valued at $2.8 million, fits perfectly into Black Girls Code’s plans for expansion. Black Girls Code has reached more than 10,000 students, opening 15 chapters around the US and one in Johannesburg, South Africa, in just seven years with even more planned for the future. Founder Kimberly Bryant told Business Journal at Silicon Valley Forum’s recent 21st annual Visionary Awards that companies also still fail to have a “holistic” outlook when approaching the inclusivity of their talent, adding that they tend to focus on “women in tech” as opposed to including women of color, who face unique challenges.